This weekend has been filled with animals. 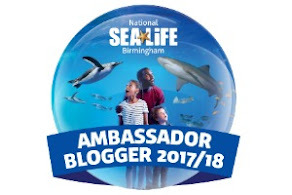 We went to Sea Life Centre Birmingham for their Ancient Oceans event (on over half term and until the end of the month) and today we are going to see some dinosaurs come to life at the Dinosaur Zoo at Birmingham Town Hall (today's the last day FYI). Oh, and because I'm indesisive, I thought I'd also include one of the penguins swimming in formation - they're my favourite and they were really playing up to the camera yesterday. That tunnel is amazing, just like swimming with them!